averaged at 6 points with respect to the levels of motivation & inspiration - a whole point above the average of people who work out of conventional office spaces. By definition a co-working space is a diverse mix of members from small and medium sized companies, freelancers, offshoots of enterprises and even remote workers, who work together in a communal setting. Here we take a look at some of the reasons they come together so well to stay inspired. The varied demography in a co-working space caters.to everyone's needs. Whether it's a millenial looking for some friends to relax with after work or a baby boomer that's looking for someone to discuss the stock market with, there's company for everyone. At The Hive we have an eclectic bunch of companies ranging from aerospace geniuses to innovative bitcoin wizards, fresh food makers, fin-tech VCs & many more. Our community mixers ensure that everyone's network grows exponentially among a mix of passionate people, enabling one to crack deals even over office lunches. The variety of people don’t just aid in growing your network but also enable a massive influx of new ideas. Our beautifully designed spaces enhance this by helping one stay in the flow & inspiring sufficient momentum to follow through on those ideas. From the lux levels of light to quaint nooks designed for different needs, our space provides the perfect comfort zone for everyone. While this may seem very basic at first, it is impossible to overestimate the importance of a 24x7 access office where the WiFi is always up & the coffee is always hot. Add to this our friendly & professional housekeeping staff that keeps the space spotless and concierge services that are ever ready to help, and you have an office that enables you to entirely focus on business growth. A co-working space opens up a plethora of opportunities via events that range from industry expert talks to actually presenting your startup idea at investor pitches, and all sorts of fun activities in between. 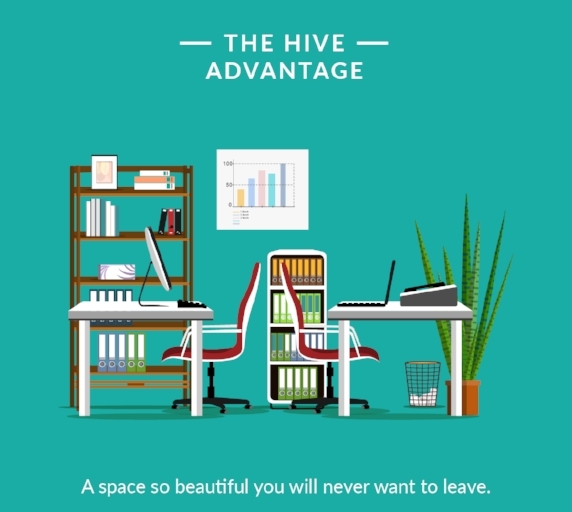 At The Hive, we promote holistic growth & well-being of our community with an integrated lifestyle offering that ensures all your needs are within arm's reach. Be it a multiplex, a spa, fitness centre, rooftop pool, event venue, shopping or even a gourmet meal, everything is simply an elevator ride away. Our privileged access & discounts only sweeten the deal further. And the cherry on top? Co-working allows you to be agile and provide the best avenues of growth for your idea without burning a hole in your pocket. Flexible contracts allow you to streamline your operations and have a healthy cash flow without the financial burden that comes with a traditionall office. that came with it. Co-working is the ideal solution to your workspace needs & also opens up a world of infinite possibilities for your business. The Hive community looks forward to supporting and nurturing you on your journey to success!